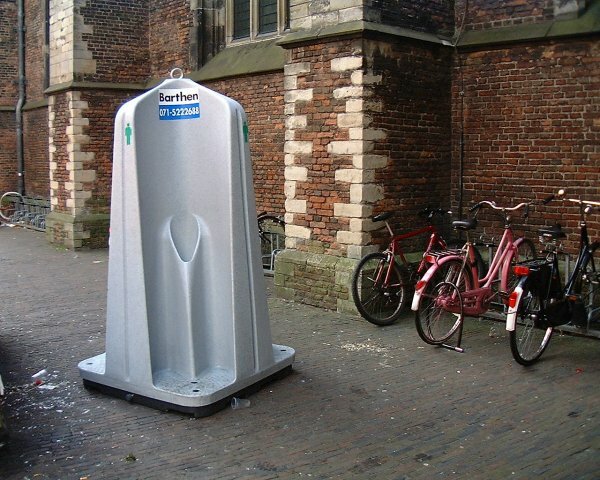 This is a public urinal found in the Netherlands (Holland). Talk about loosing privacy but on the other hand men usually don't need much privacy while going number 1. The way the walls are angled it would be very hard for people to see anything private. Think of the benefits of this urinal vs a traditional public restroom. It's easy to clean, takes up very little space, and will probably not be covered by graphiti. I have actually come to like it. I wonder what the Dutch people think of it? Addition: I've seen these used in other European countries as well....especially at big public events such as concerts or festivals.